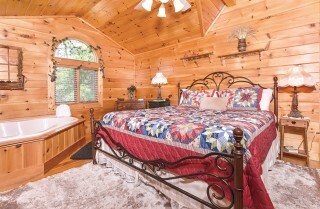 Located conveniently near downtown Pigeon Forge and Gatlinburg, Sky Surfer is a beautiful Smoky Mountain cabin with some great updates. 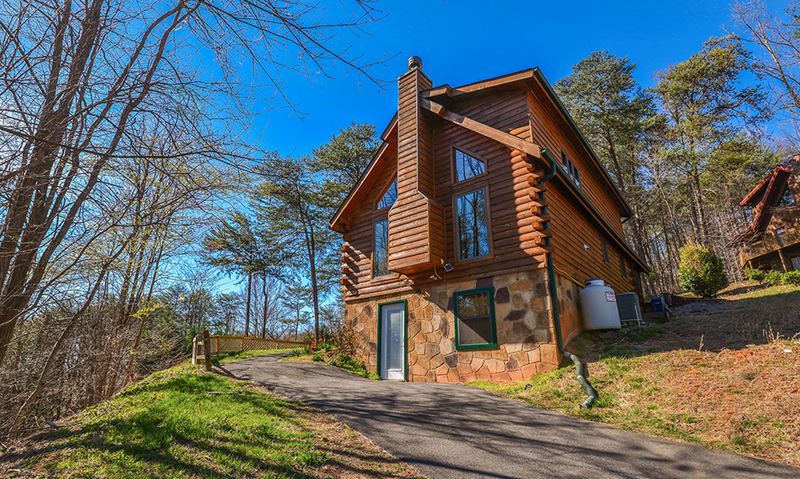 It's full of charm and comforts, and it boasts great mountain views and modern amenities. 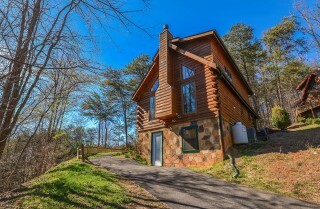 It's really the best of both worlds, with a location near the fun of the Parkway and a semi-private location in the mountains. You can take a short 6-mile drive to downtown Pigeon Forge for shopping, dining, and fun, or you can stay in the cabin to soak up the mountain and wooded views, enjoy the serenity, and play in the comfort of your own cabin in the mountains! Inside, enjoy days of fun and plenty of comforts, from the big screen TV and fireplace in the living room to the pool table in the rec room. 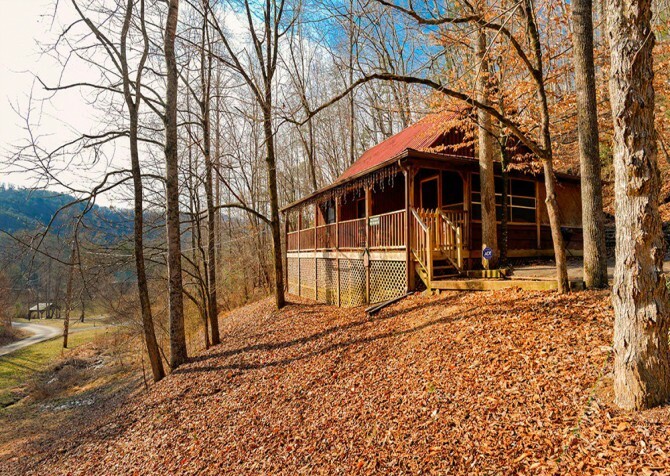 Outside, relax among the trees with a picnic table, fire bowl, screened-in porch, and rocking bench. 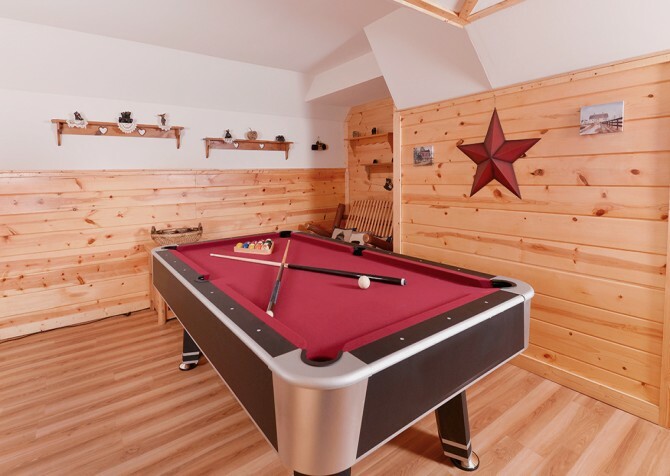 You can even spend some time throwing around a football or letting the kids play in the large, flat yard that's fenced in! The 2-bedroom, 2-bathroom cabin with room for 6 guests is the perfect fit for 2 couples, a family, or a small group of friends. 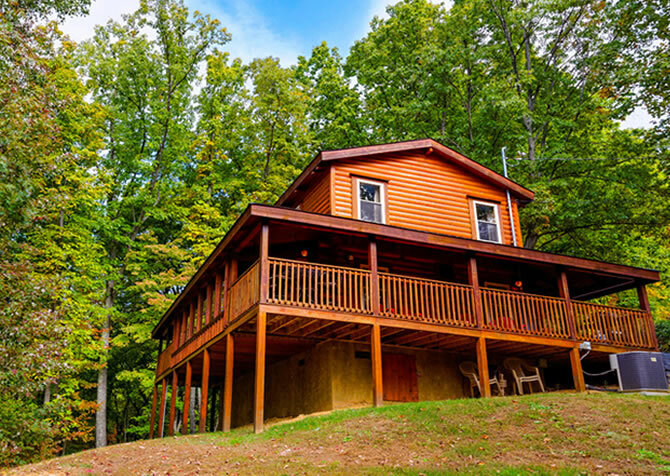 This beautiful cabin is fun, relaxing, cozy, comfortable, and newly refreshed – everything you need for a fantastic stay in the Great Smoky Mountains! With wood interiors, stylish sofas, and a mountain motif, the living room of Sky Surfer is a relaxing place to hang out. In cool weather, take advantage of the beautiful stone fireplace in this space. 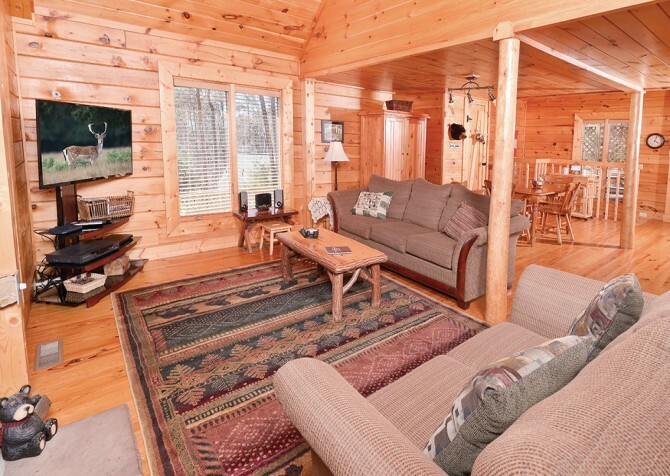 Enjoy cool mountain nights reading a book or playing cards or board games on the log coffee table in the center of the room. The living room also features a new 48-inch flatscreen TV that's perfect for watching movies, Saturday morning cartoons, or your favorite late-night shows. On sunny days, enjoy the sunlight that will stream in through the windows around this room. 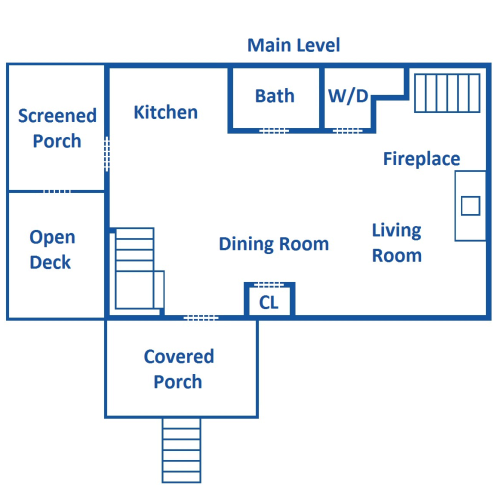 It will keep the space light and bright on the days you just want to spend some time inside. The living room also opens up to the dining area and kitchen, so you can quickly grab a snack or drink during commercials. Whether you're here with friends or family, we know you'll enjoy relaxing in this cozy space that will feel like a home away from home. A charming kitchen with light wood cabinets and white appliances offers a convenient place to cook your own meals during stays in the Smokies. 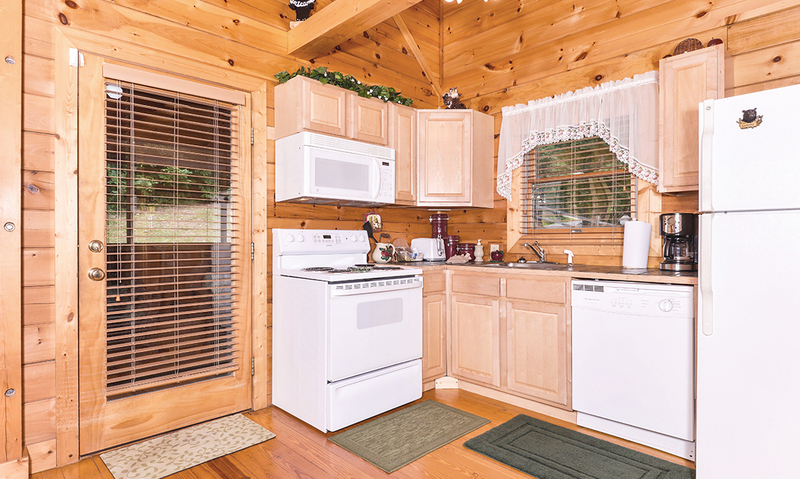 You'll have your own refrigerator, dishwasher, oven/stove, and microwave, along with conveniences like a coffeemaker and toaster for quick breakfasts or nice family meals. 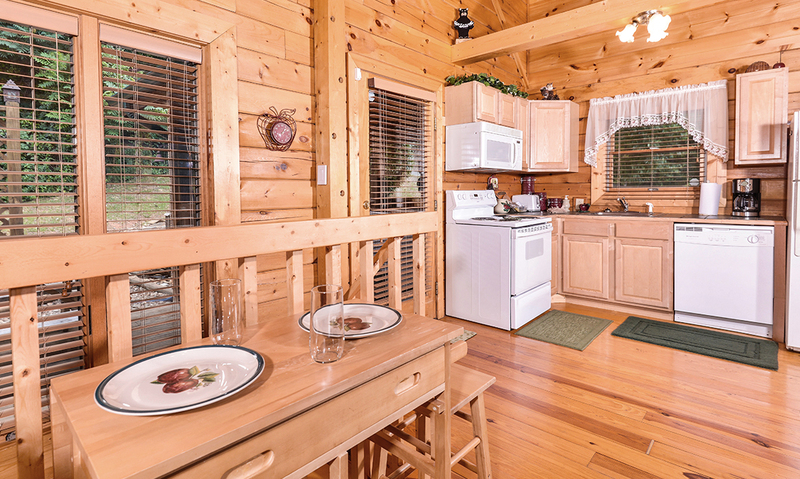 When you do want to go out to eat, you can use the kitchen to store leftovers from area Pigeon Forge restaurants or chill some wine from a local winery. The dining area of Sky Surfer is adjacent to the kitchen and living room. 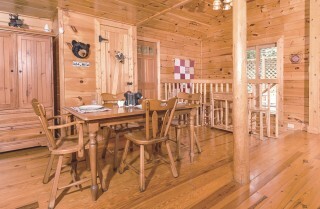 It features a country-style table for 4, along with a small table with stool seating for 2 more guests. So everyone can sit down for meals and enjoy some great food and conversation. And because it's so close to the kitchen, it will be easy to grab seconds without missing out on what's going on. 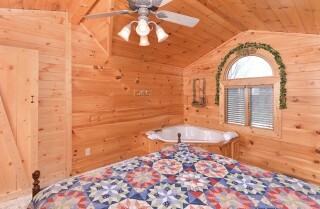 The 2 bedrooms in Sky Surfer will offer quiet places to relax and unwind at the end of the night. 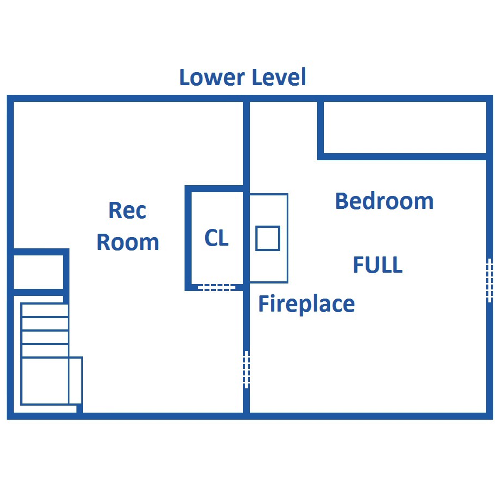 On the lower level, find a bedroom with a full bed, a fireplace, and its own TV. 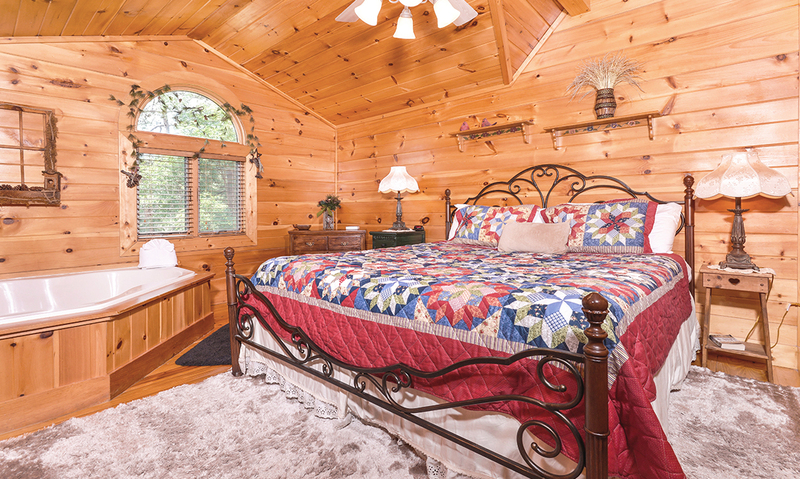 On cool nights in the Smoky Mountains, enjoy the warmth of the fire while you read in bed or watch your favorite show while drifting off to sleep. The room also features nightstands with lamps and a small dresser so you can unpack your things during your stay. 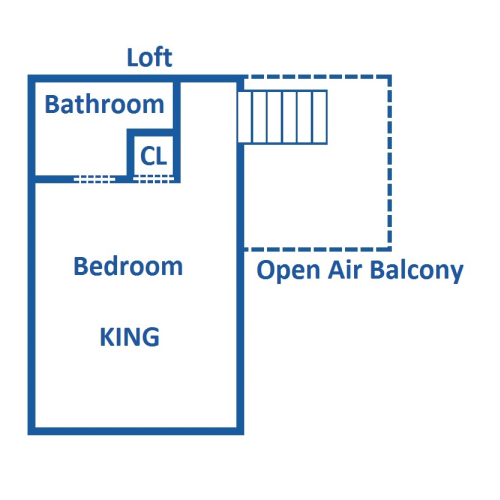 Upstairs, a second bedroom features a king-size bed and its own bathroom, adding to the convenience for guests. 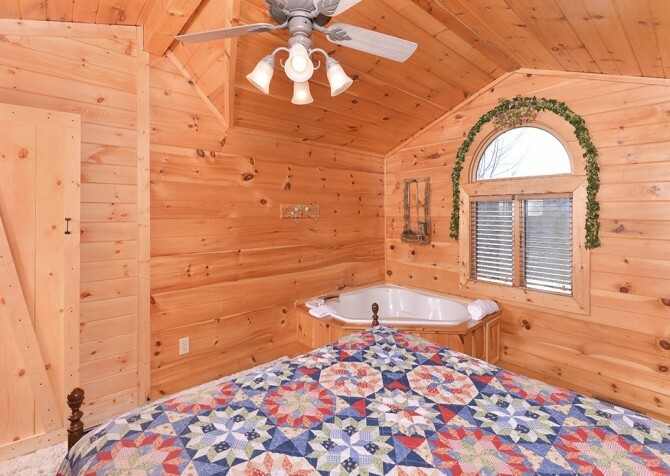 It also has nightstands with lamps on either side of the bed, a dresser, and a soothing jetted tub in the corner. 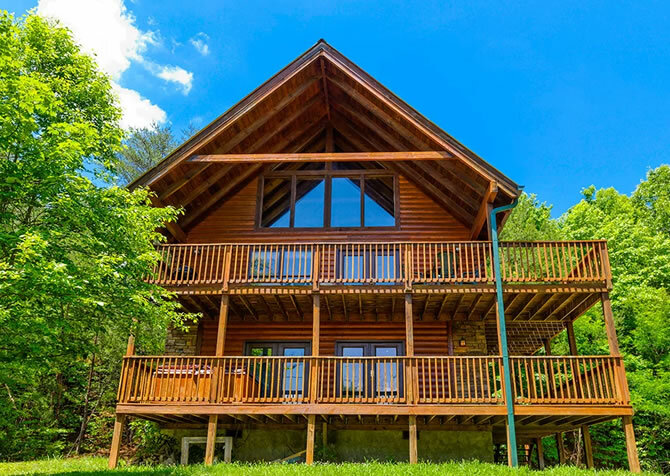 There are always plenty of fun things to do in nearby Pigeon Forge, from family-friendly attractions and outlet shops to annual events and parades. 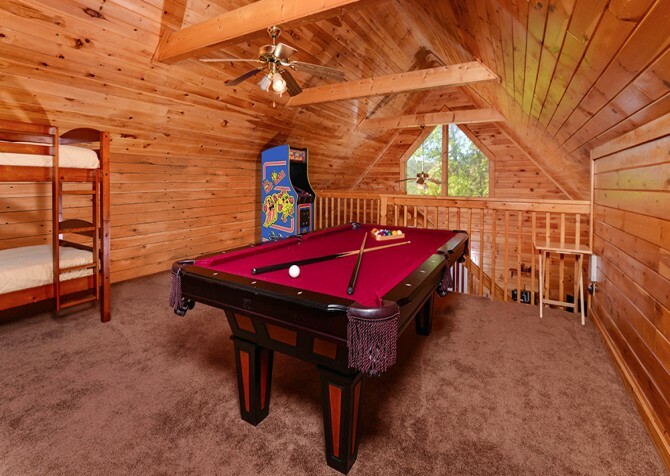 But when you stay at Sky Surfer, you'll have entertainment within the cabin as well. In the rec room on the lower level, play a few rounds of pool on the new pool table or sit back and relax on the log bench with mountain-themed pillows. 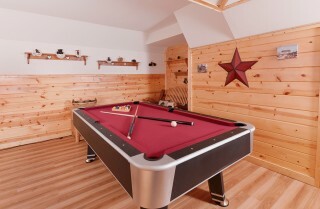 With a mix of painted walls and wood, this room is light and bright for fun days of playing in the cabin. 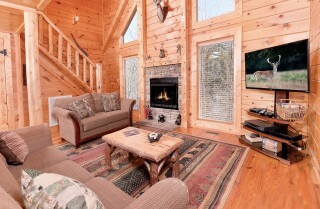 Sky Surfer boasts some awesome outdoor spaces that you won't find at many mountain cabins. Its large, flat yard is fenced in, so you can play with the kids, kick around a ball, or lay out some beach towels and soak up some summer sun. On the open deck, enjoy picnic lunches at the picnic table. Make some sandwiches, grab some chips and drinks, and just hang out in the beautiful outdoor spaces afforded here. Or you can use the grill to make burgers and hot dogs. At night, start a fire in the fire bowl and roast marshmallows for s'mores. 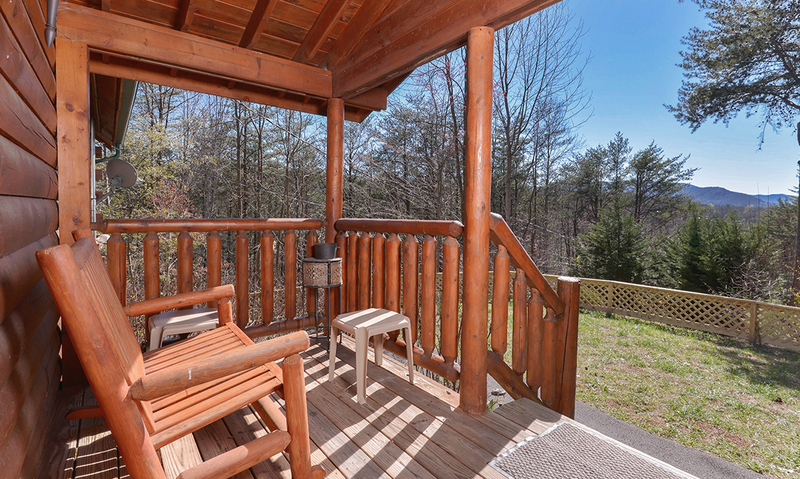 When the bugs are out, make your way to the screened-in porch, where you'll find chairs and rockers for sitting back with a cup of hot chocolate or a glass of wine. There is also a covered porch with a rocking bench looking out over the beautiful Smoky Mountains. 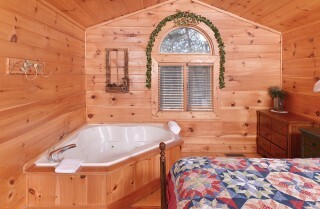 And when the day is done, climb into your hot tub to unwind! At Sky Surfer, you'll have plenty of great outdoor spaces to enjoy the fresh air, awesome weather, and gorgeous mountain and wooded views! If you want to stay connected, Sky Surfer offers high-speed wireless internet. You can catch up on some work, do some online shopping, or keep up with our blog to see what's happening during your stay. You'll also have a DVD player and CD player, board games for family game night, a sleeper sofa for extra space, and a washer/dryer for your convenience. Need even more? Sky Surfer is located in the Sky Harbor resort, offering guests even more amenities in the community. Two nice, well-stocked fishing ponds in Sky Harbor are located just below the cabin. Maintained by the Sky Harbor Association, the pond is a lovely spot for an afternoon of fishing. 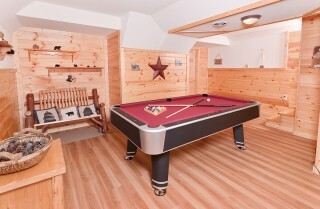 There are even fishing poles at the cabin for guests to use during their stay if they want to try their luck at fishing! Get your blood pumping on a thrilling roller coaster, win a giant stuffed bear on a carnival game, sit down for a delicious Southern meal at a cafe, catch a fantastic musical show, or cool off with some ice cream – all during a fun day at Dollywood Theme Park right off the Parkway! Serving up heaping plates of your favorite Mexican foods, No Way Jose's in Gatlinburg is a local favorite. Fill up on rice and beans, giant burritos, sizzling fajitas, chips and salsa, and more! Laugh until you cry (and enjoy a good meal) with “Whodunnit Lucy,” “Moonshine Murders,” “Frankly Scarlett, You're Dead,” or “The Killbillies” at this dinner show in downtown Pigeon Forge. "Stayed at Sky Surfer for our honeymoon! 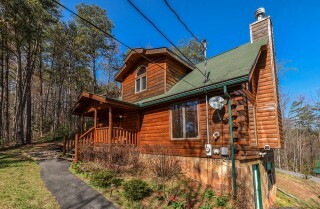 Fell in love with the cabin! Will definitely come back."